USA  2018  95m   Directed by: Ben Young.  Starring: Michael Peña, Lizzy Caplan, Amelia Crouch, Erica Tremblay, Lex Shrapnel, Emma Booth, Lilly Aspell, Mike Colter, Israel Broussard, Sandra Teles, Tom Riley, Michael Absalom, Mina Obradovic.  Music by: The Newton Brothers. This is what you get when you combine a half-baked script full of cliches with an inexperienced director and poorly executed CGI, set design and lighting. How this film ever started life as a sci-fi studio film for Universal is beyond me as the visual effects are sub par and the directing, editing and continuity of action in scenes is very disappointing. It has been a long time since I have watched a film that made me cringe but there are plenty of cringeworthy moments in this film, like when you see the "aliens" hacking a knife through a wall, I thought I had switched channels and was watching a low budget slasher pic, or the final scenes of the movie when the protagonists escape on a train, the CGI is so bad it's beyond embarrassing that it even made the final cut! The director Ben Young is struggling with his Hollywood debut the whole way through Extinction and drowning. Miserably. This so called twist of this movie is really not that surprising. The script is certainly not groundbreaking! Perhaps the writer missed the zombie inversion film Hidden. 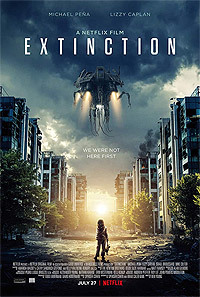 The director tries to disguise the invaders in Extinction with Predator sounding noises, but the whole time you can't shake the feeling that these "aliens" are just humans dressed in scuba outfits and the main characters are devoid of real emotion albeit the screeching kids. I agree with other reviewers you really have no empathy for the main characters and are not at all invested in whether they live or die. I guess the question for Netflix fans is are they happy for Netflix to continue to fork out big money to pick up the B Grade movies the studios have dumped and don't want to release or would Netflix money be better spent elsewhere? The reviewers who are giving this a 8, 9 or 10 are crazy, they are the kind of scores reserved for the best sci-fi movies of all time. I know the filmmakers have taken to Instagram begging people to rate their movie highly so I guess that explains the biased high scores. In a nutshell fine to watch to kill some time but otherwise I wouldn't bother as there is nothing original here. Review by brendantimms from the Internet Movie Database.